What’s more, instead of blindly groping for our hotel, I stopped and asked two “salary-men” aka workers. 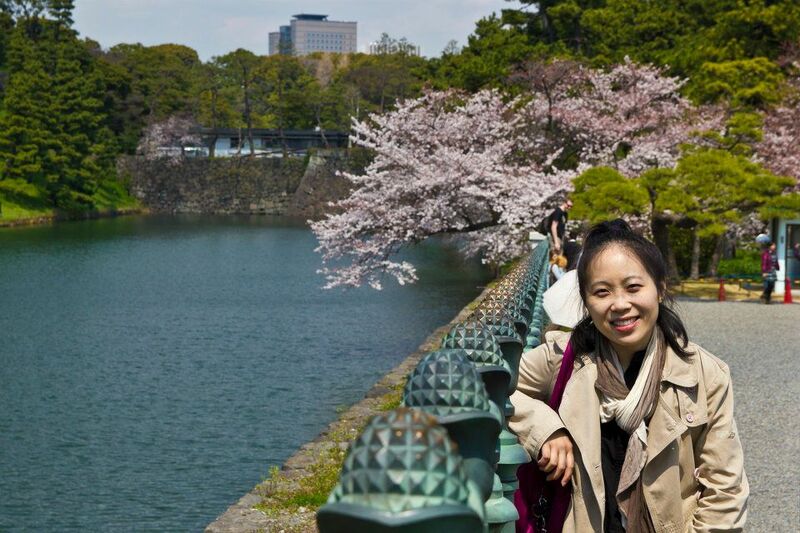 We quickly found Hotel Villa Fontaine Ueno 10 minutes away from the stop. We dropped off our luggages and took the train to Ueno Station (not quite as close by as one thinks from our hotel). The night started to set in. 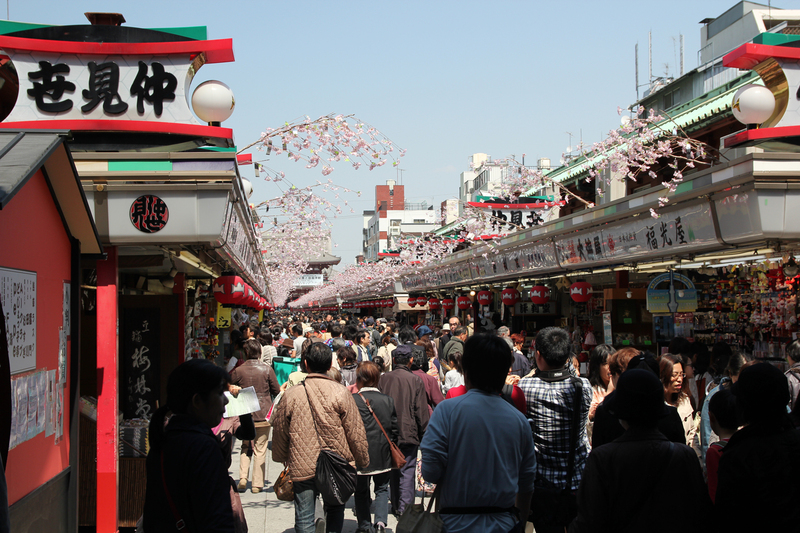 We were set to hit Ameyoko アメ横 an open air bazaar, Yamashiroya ヤマしろや a vinyl toy store and for dinner. 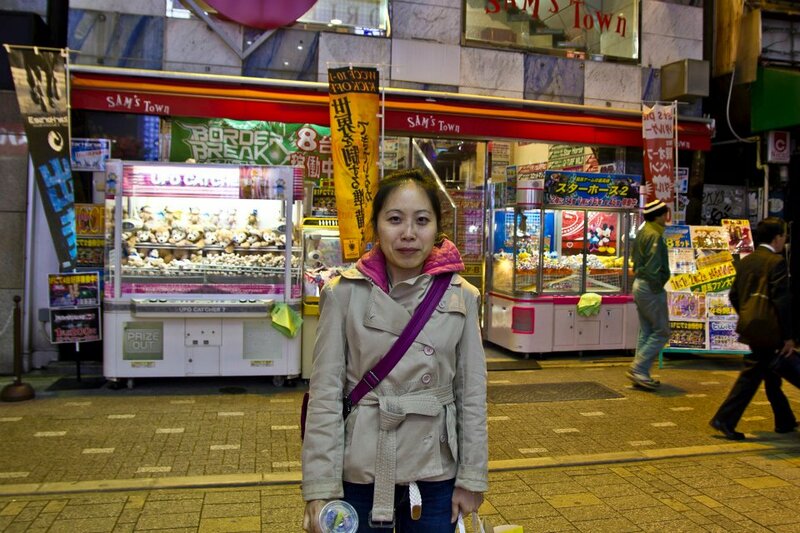 Once at Ameyoko, we were greeted with the foreign sounds of pachinko machines and the bright lights accompanying it. It was truly fascinating. 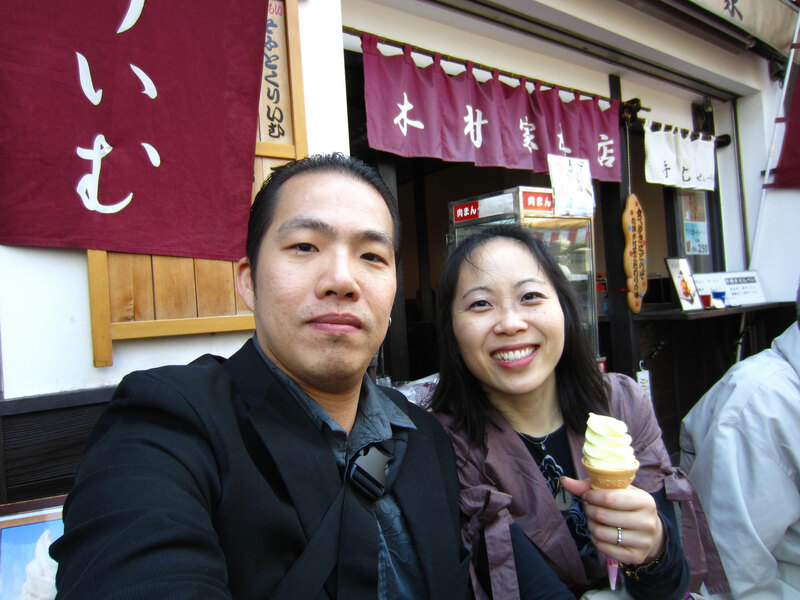 We were going to linger, but since Yamashiroya was closing soon, we decided to find the store first and walk the streets of Ameyoko later. 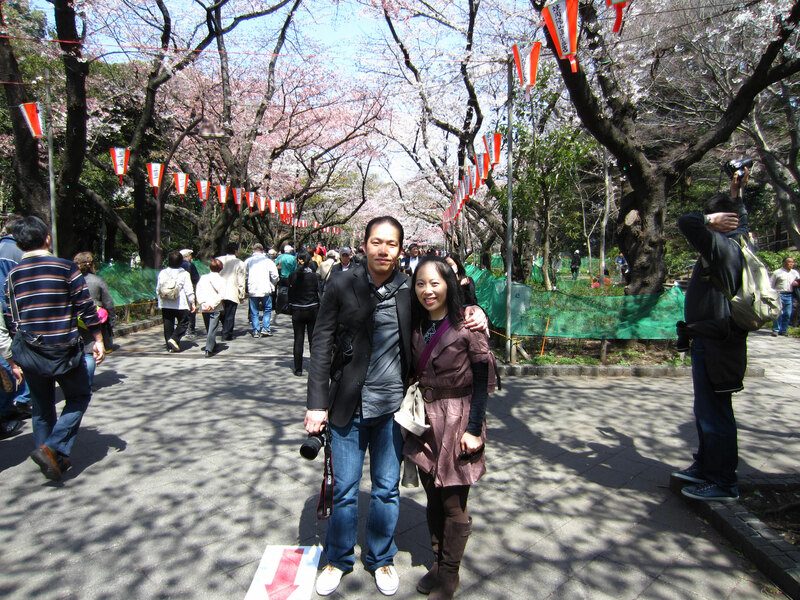 We found Yamashiroya with the help of two Japanese ladies and immediately went hunting. This store is 7 floors of manga/anime haven. After holding back from when we first came, we got our first two figurines: Hatake Kakashi (Naruto ナルト) and transformed Kurosaki Ichigo (Bleach). 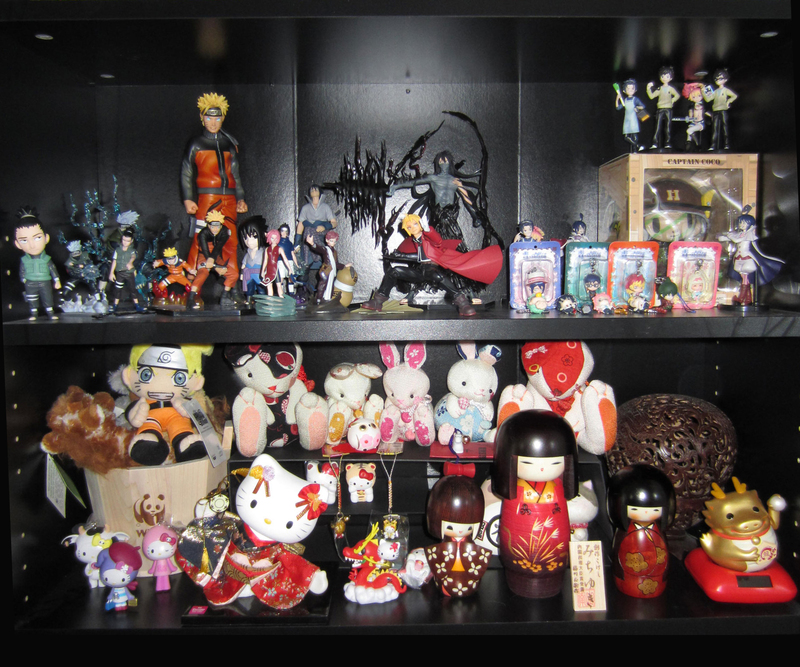 The array of figurines fed our eyes but not our stomach. So we went searching for food in Ameyoko, a Malaysian Petaling Street of sorts. Seeing that the roadside stalls didn’t have menus, aka pictures to point to, we had to forgo it (even though the food and conversations looked mighty lively). Instead, we settled on a yakisoba-okonomiyaki-takoyaki-beer-serving store. Dinner served its purpose, but was not fulfilling. By 8:30/9:00 pm, most goods-selling-stores were starting to close up for the night. Only the food stalls were left. We stopped at a dumpling place, and was pleasantly surprised when the lady started speaking to me in Mandarin. Oh! 同志! Comrade! We had some steamed buns, and proceeded to a bubble tea shop (also owned by a Chinese!) For once, my Mandarin got us somewhere! As we strolled around the neighborhood, and saw the abundance of pachinko arcades, hubs decided to try his luck on one of the machines. 1000¥ lighter, I told him he is not going anywhere at all. He tried to convince me otherwise, saying that, “I’ve got it! The next one is a sure win.” I left. He finally did too. We then happen upon a store called Yodobashi ヨドバシカメウ, an electronic store that has an entire floor just dedicated to vinyl figurines. Damn if we didn’t see this first! This store is way cheaper than Yamashiroya, and had more things that we were looking for. (Lesson learned! Prices are not the same across the board) However, they had run out of Naruto and Sasuke, but told me they have another store in Akihabara, which may have more. Disappointed, yet hopefully, I picked up some Ao no Exorcist 青の祓魔師 gashapon mini figurines while hubs (after pouring hours into deciding which figurine he wanted) settled on a Gundam Bandai model kit. Truly sate, we headed back to the hotel to rest up for the next day’s adventures. 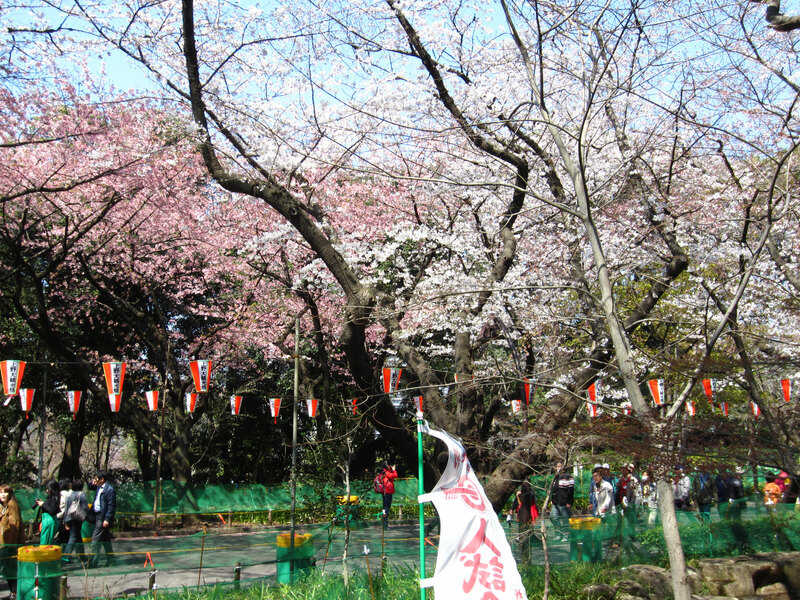 Ueno Park (Ueno Koen 上野公園), as one of the country’s first public parks, was built in 1873 on lands formerly belonging to the temple of Kan’ei-ji (Tōeizan Kan’ei-ji Endon-in 東叡山寛永寺円頓院). 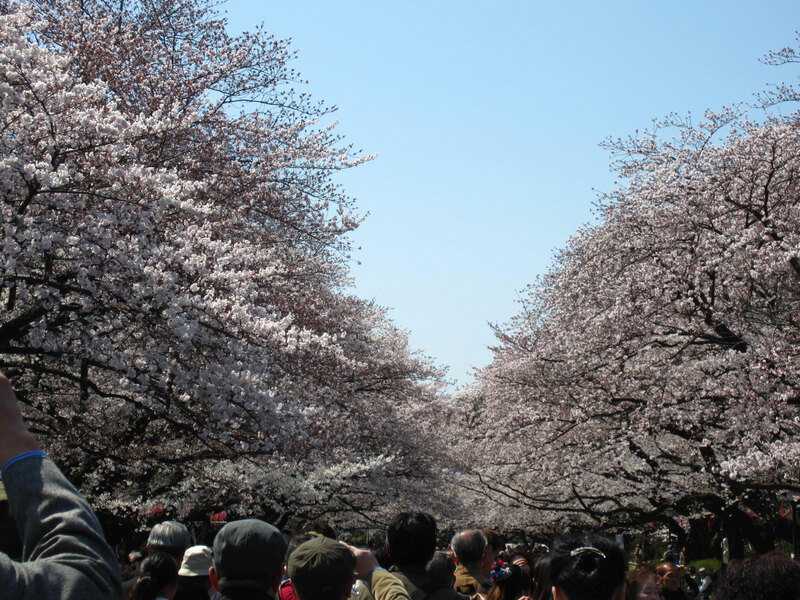 It is home to a number of major museums, zoo and is well-celebrated in spring for its cherry blossoms. 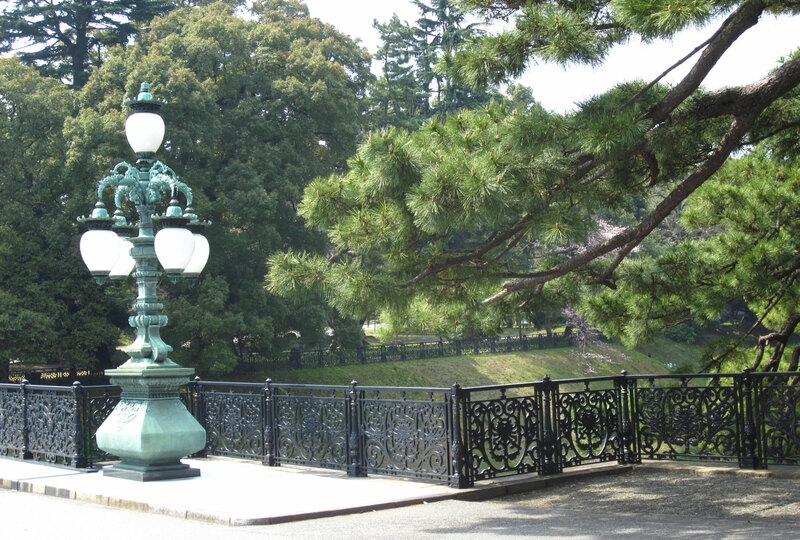 It is said to be situated in the “unlucky direction” northeast of Edo Castle. Most of the original temples were destroyed in 1868 during the Boshin War, where the Tokugawa shogunate was defeated by those seeking to restore the Imperial rule. 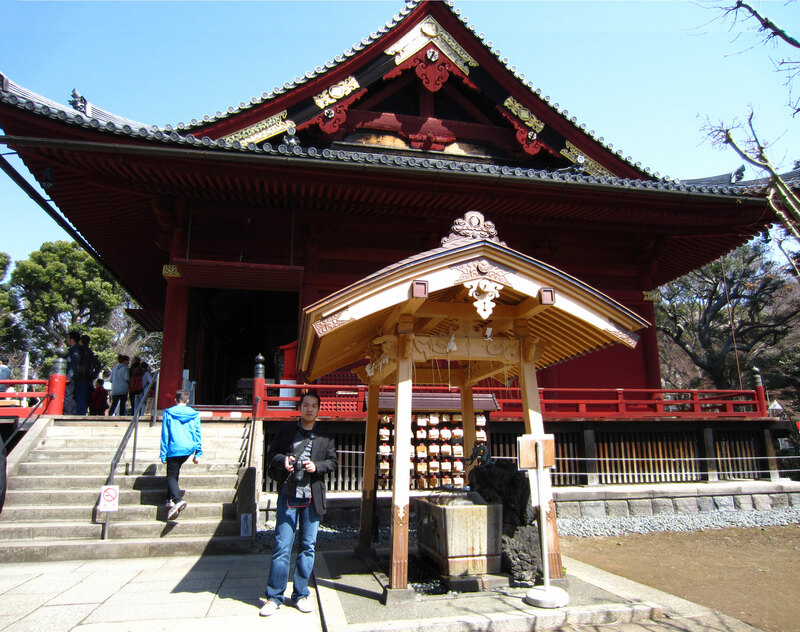 Today, only the five-storey pagoda (1639), Kiyomizu Kannondo (or Shimizudo) and the main gate remain. 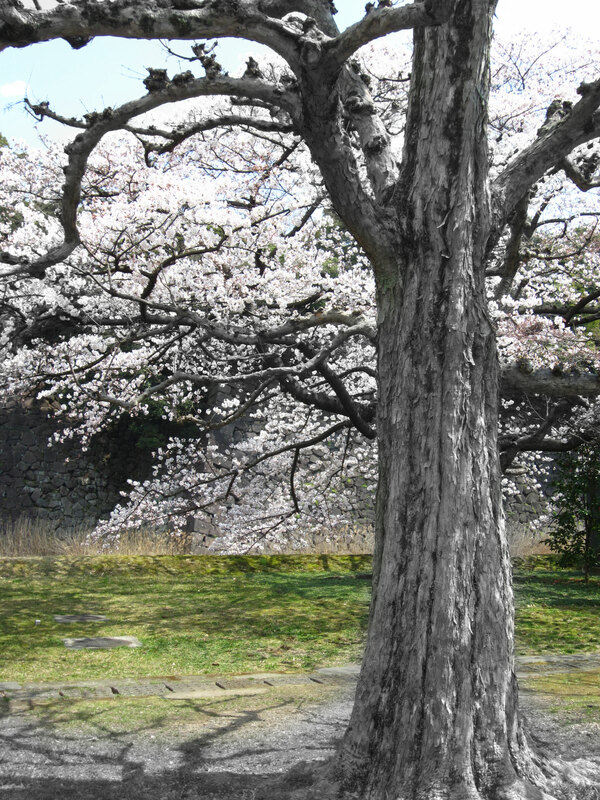 The park is now home to some 8,800 trees including Ginko biloba, an assortment of cherry trees and cherry blossoms. The festivities were only marred by rudely shouting and overly eager Mainland Chinese tourists, pushing their way through lines and “discussing” their marital problems out in public. Nothing like airing dirty laundry. 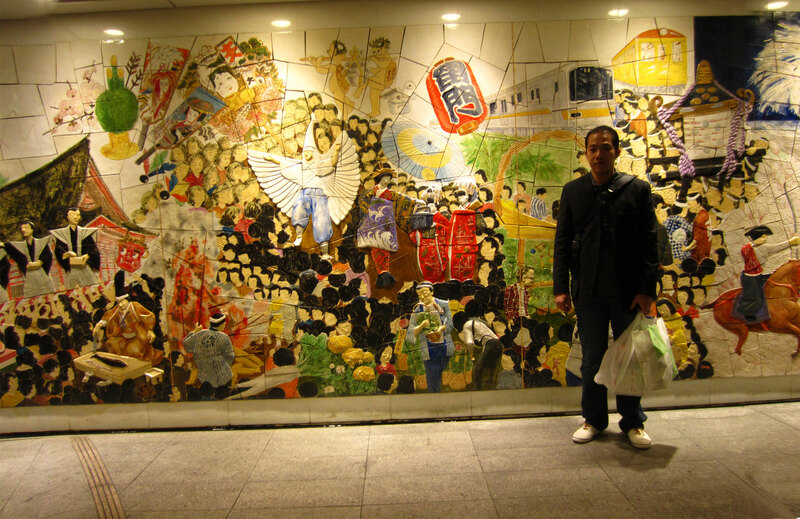 From there, we took the Ginza line to Asakusa 浅草 (G19). Ascending into the streets, we were greeted by traditional rickshaw pullers and hubs (the constant sucker) wanted to ride one. I reasoned that we had much to do for the day, since rain was forecasted for Friday. 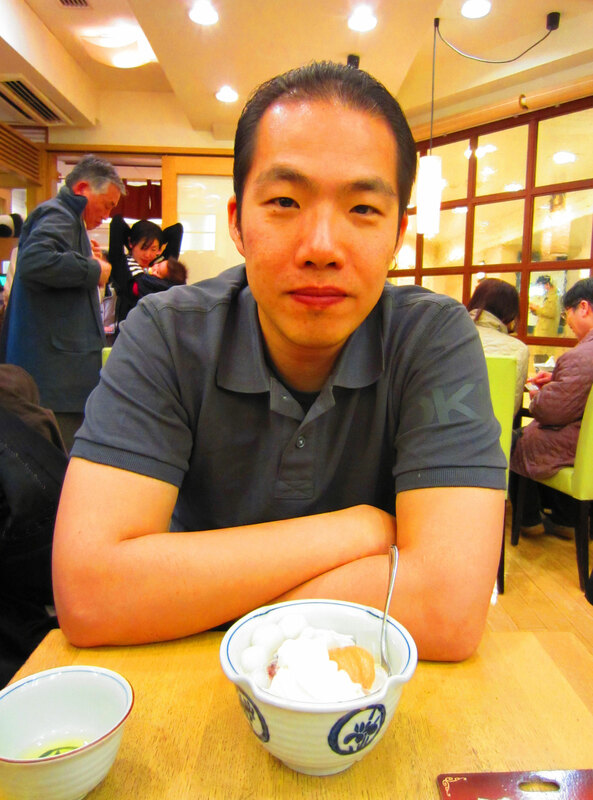 He sulkily agreed as we walked towards Sensou-ji or Kannon Temple. 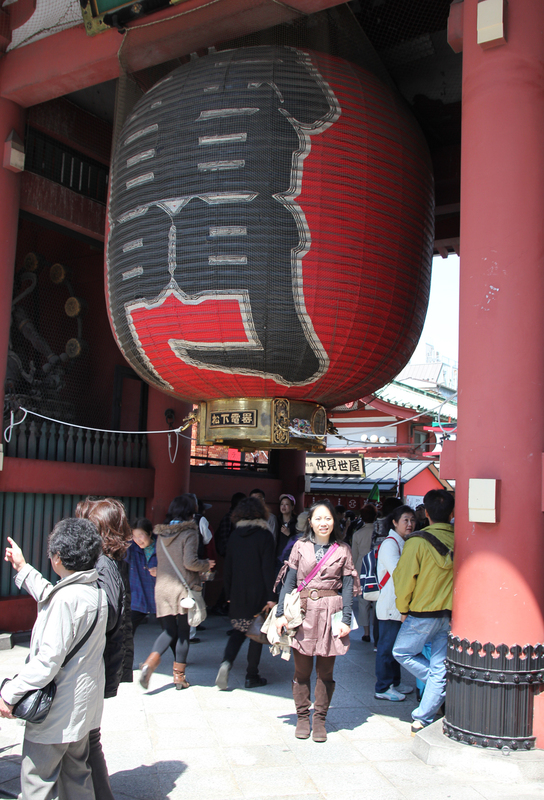 We immediately entered Kaminarimon 雷門 (Thunder Gate), the renown face and front gate of Sensou-ji and Asakusa. 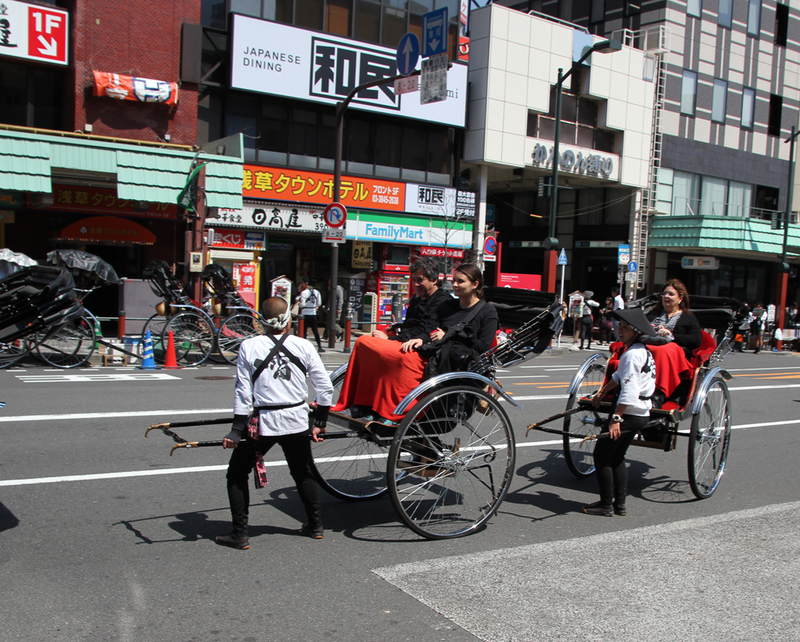 We learned this little known fact from our rickshaw puller (on Friday, after hubs convinced me to “take a load off”): In the olden days, when Edo (the old name of Tokyo) was taking over Kyoto as the capital, many people walked from the former capital into Edo and the first city they stopped at was Asakusa. Most of these travelers reached Asakusa with broken geta (木屐/下駄, traditional Japanese footwear resembling clogs and flip-flops). That’s why Asakusa has an abundance of shoe shops. Sensouji (Kinryū-zan Sensō-ji 金龍山浅草寺) is an ancient Buddhist temple, and Tokyo’s oldest (built in 645) and most significant temple. The temple is dedicated to Kannon, known to the Chinese as Kuan Yin or the Goddess of Mercy. 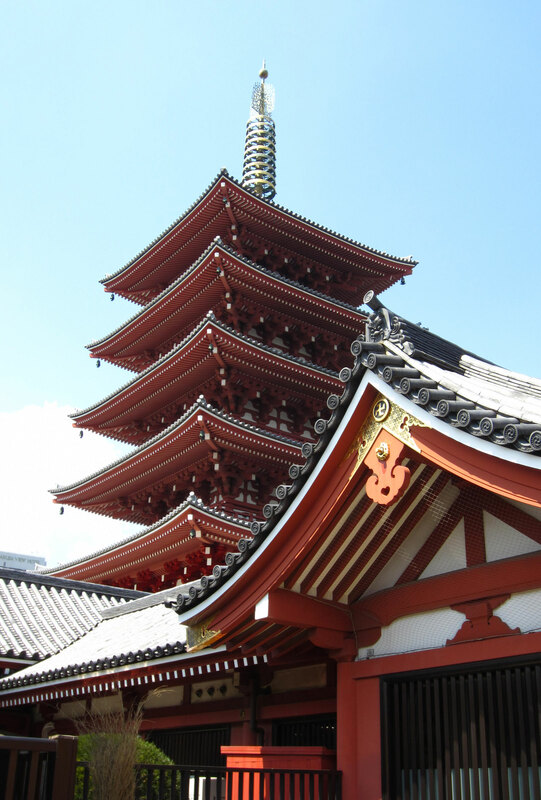 This temple was so important, that during WWII, when much of the country’s steel were melted down for the war, the temple’s bell (which is rung every two hours to signify the passing of time) was sparred the melting pot. 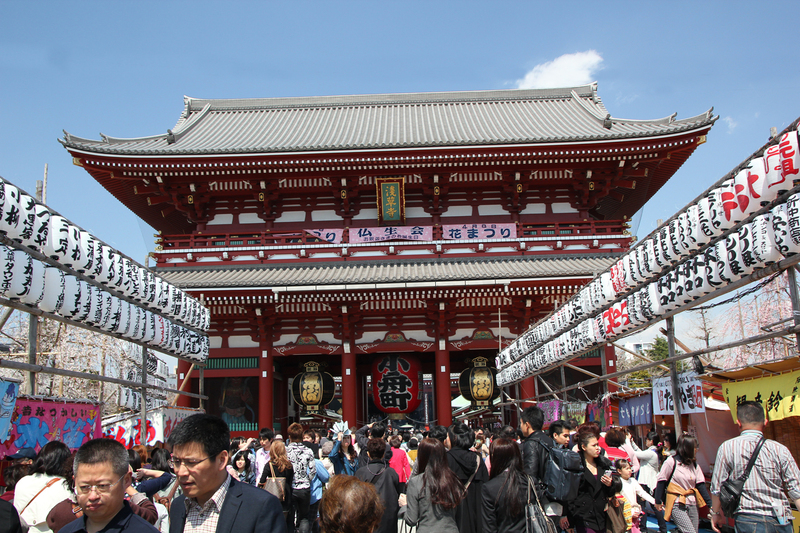 Pass the Kaminarimon, we were greeted by the hustle and bustle of Nakamise dori 仲見世通り. 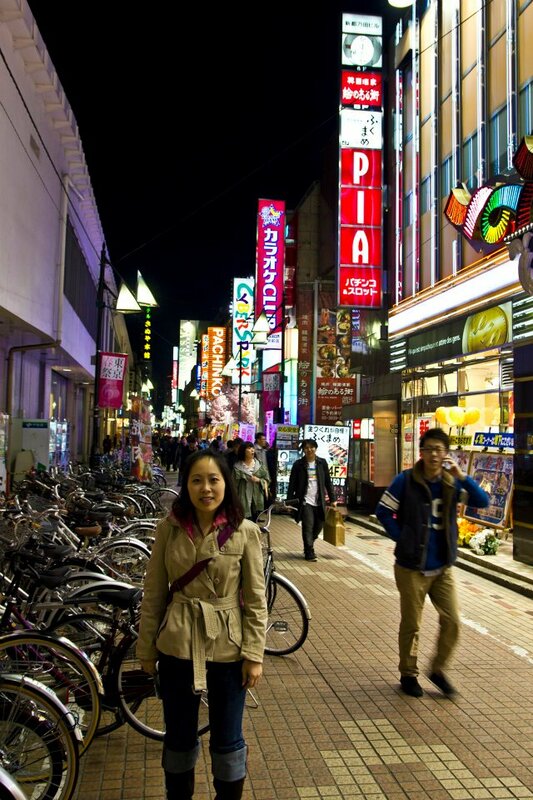 The street is 250 meters in length and has about 89 shops. 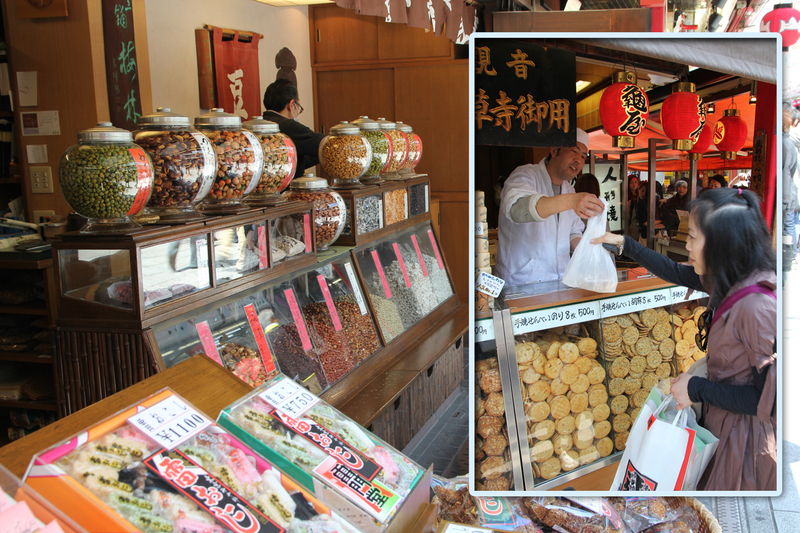 These shops sell a range of souvenirs, knick-knacks, ukiyo-e (woodblock prints), food stuff and most importantly, senbei 煎餅 rice crackers. The rice crackers are baked or grilled, done traditionally over charcoal, which they do upkeep. Sweet senbei (甘味煎餅) came to Japan during the Tang Dynasty (737 AD), but the Chinese biscuits have slowly evolved to become more like wraps and pancakes (similar to okonomiyaki) than the hard, bite-size crackers of Japan. After the bombardment of senses on Nakamise dori, we reached Houzoumon (宝蔵門 Treasure House Gate), which leads to the inner complex of the temple that houses the scriptures of the temple (hence the apt name). There was a surprising large crowd of people, locals and tourist included, on a working weekday like this. On the left of the temple stands a five-story pagoda. We then walked around the neighborhood and stopped for ice cream, where two long benches were set up outside the store for customers. Not only were we enjoying the ice cream (I had golden kiwi while hubs had melon), we were taking in the view of the area and its people. It was a beautiful day and the weather couldn’t have been more perfect. Rested, and with time to spare, we chugged along to Akihabara, also known as Electric and Otaku Town, on the Hibiya Line (H15). Akihabara (秋葉原 Field of Autumn Leaves) is a major shopping area for electronics, computers, anime, manga and otaku goods. Most of these stores are found on Chuo dori. We visited Eshikusu エシクス, which had ultra cheap figurines and got a Revoltech Edward Alrich (Fullmetal Alchemist) figurine and a Naruto figurine, right off the Akihibara station on the right. Then we stopped at Yodobashi-Akiba and swept up the Uzumaki Naruto and Uchiha Sasuke figurines (Naruto) and some Ao no Exorcist half age blind boxes. What a thrill! But how do we pack?! Buy first, worry later. 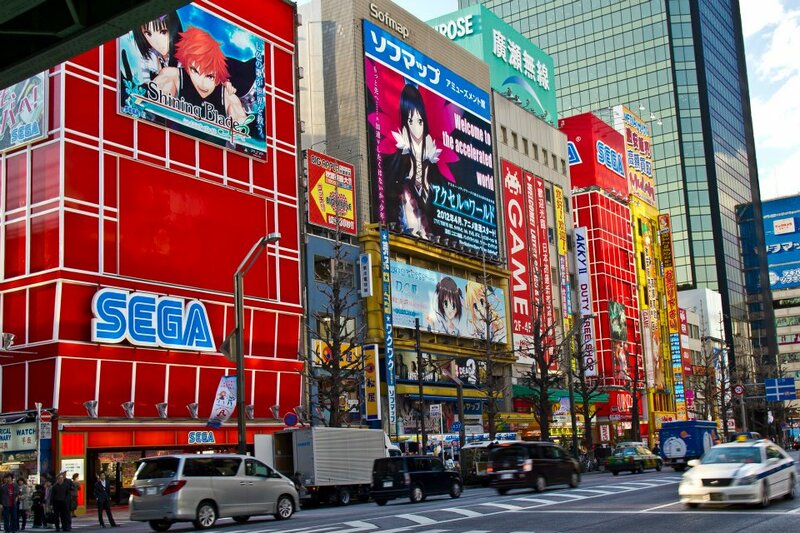 Finally, we stopped at Akihabara UDX, a multi-floor complex with restaurants and the Tokyo Anime Center. Unfortunately for us, the Tokyo Anime Center was under renovation, but the restaurants were running. 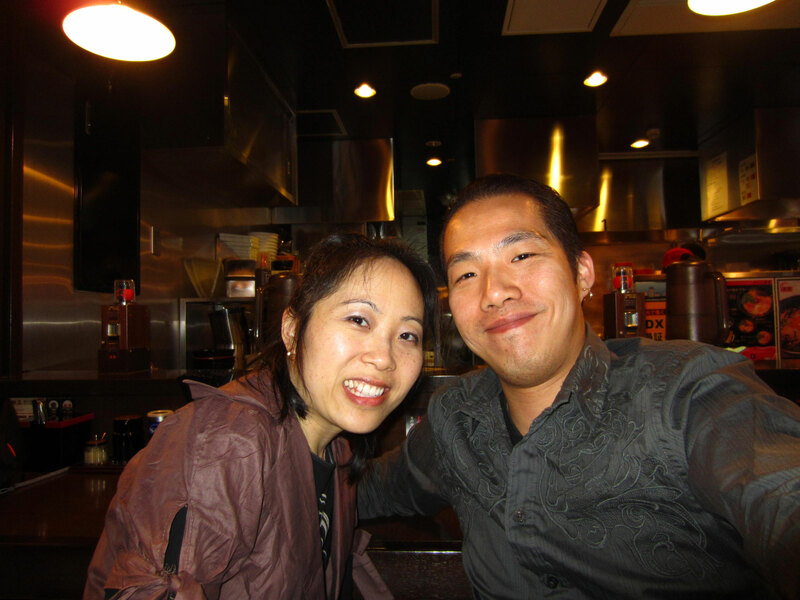 We stopped at the Ramen Kouryuu Akiharabaten ラーメン康竜 秋葉原店 and had a fulfilling dinner. We had the option to pick the thickness and consistency of our noodles, the oiliness of the soup, and different ingredients we wanted in our bowl. What’s not to love?! Noodles were chewy. Soup was the right amount of oil and salt. Egg, as usual, perfect. Even the pork was succulent and tender. Stuffed to the gills, we made our way to Tokyo Tower 東京タワー (again). We took the JR Yamanote Line, switched trains at Daimon station to the Oedo Line and finally stopped at Akabanabashi Station (E21). Finally! The Tower in clear skies. 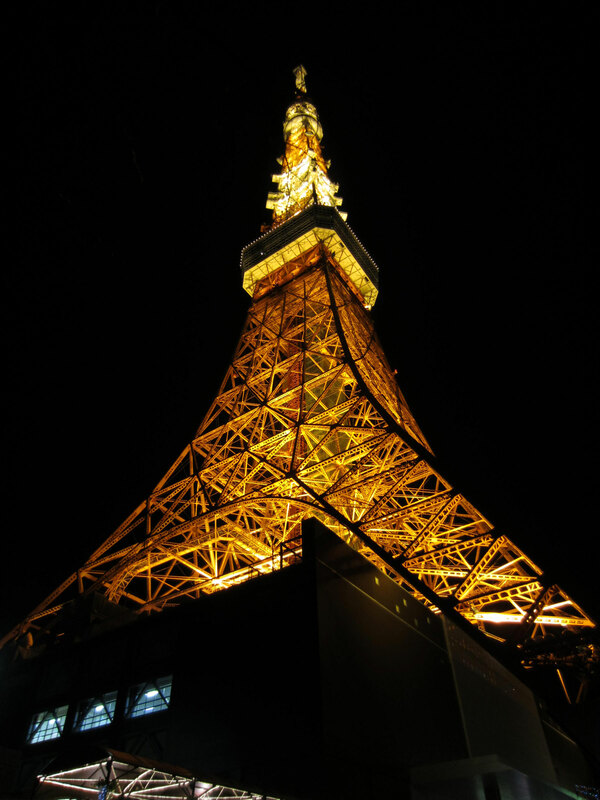 Coming here, reminds me of the drama series of the same name, Tokyo Tower, by Matsumoto Jun (my sister’s Japanese hottie). Entrance fee to the main observation deck of this communications and observation tower was 820¥. Standing at 333m in height and coming in at 4000 tons, the Tower was built in 1958 and became the world’s tallest self-supporting steel tower. 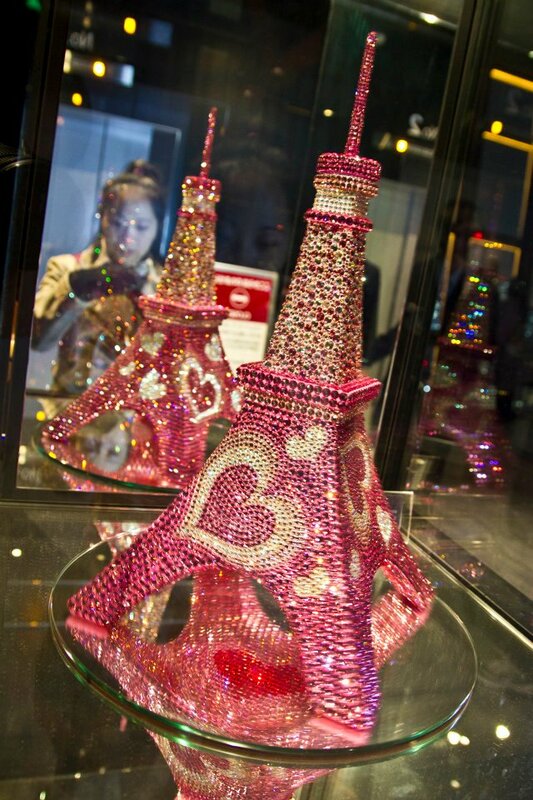 (The Eiffel Tower in Paris in 320m in height and 7000 tons). The main observatory deck commands a 360º view of the entire Kanto Region surrounding Tokyo and stands at 150m (490 ft). Since it was a Thursday night, Club333 (aptly named for its height) in the Tower had a live performance staged. We bought some souvenirs from the Tower, including some Hello Kitty charms/phone danglers. As hubs put it, “Those people who made Hello Kitty ought be shot for making these things so damn cute!” Even he couldn’t resist them, what more me! Suckers or not, we fell for the hype. As the night drew to an end, we decided to make one last stop and headed for the famed Rainbow Bridge レインボーブリッジ in Odaiba. 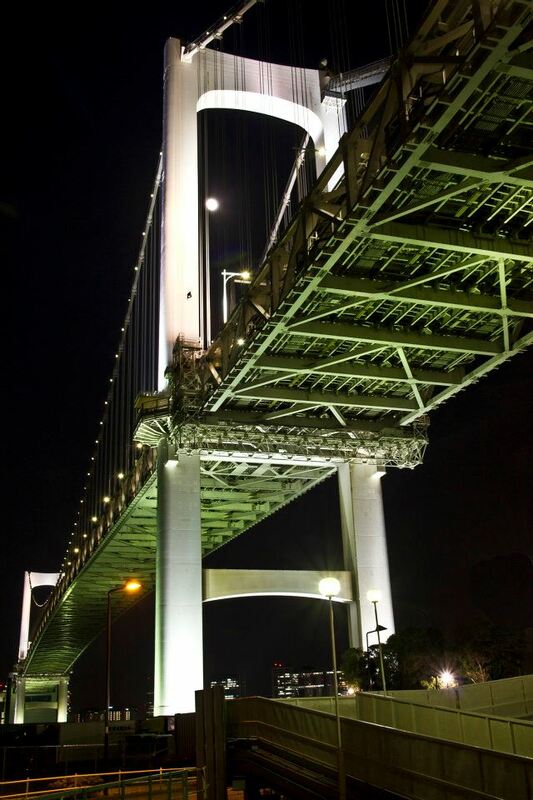 The 798m (2618 ft) long Bridge is a suspension bridge crossing Tokyo Bay into Odaiba, a reclaimed land. We took the Oedo Line to Shiodome (E19) and changed lines to the Yurikamome train, and stopped at Shibaura-futou (U05). There is a pedestrian walkway on the bridge (summer 9am-9pm), but upon seeing the height and the wheezing cars, I surrendered, shakily. I told hubs he can go ahead without me, but he passed on it. We didn’t see much of a rainbow on the bridge. In fact, there wasn’t a rainbow at all. (The lights on the bridge draw on solar energy to illuminate during the night) Tough luck, huh? Limp from our trek, who hauled our goodies back to the hotel to begin the resting and packing process…which lasted into the wee hours of morning. Thank goodness for the stash-away bag that I brought in my carry-on luggage. It was supposed to rain. It was. And we even borrowed bigger umbrellas from the hotel. The sun was out, with not a cloud in the sky. So we hauled two brollies around like idiots the entire day. Not that we were really complaining. First stop, the Tokyo Imperial Palace. After months of trying to get on the tour online, it finally became a reality. We took the Hibiya Line from our hotel, changed to the Chiyoda Line in Hibiya Station (H07), and took it North to Nijubashimae (C10). From there, it was supposed to be a 10-minute walk to the Palace, but felt like I had run a marathon after we frantically ran to Kikyo-mon, where the tour began. We made it by sheer luck. 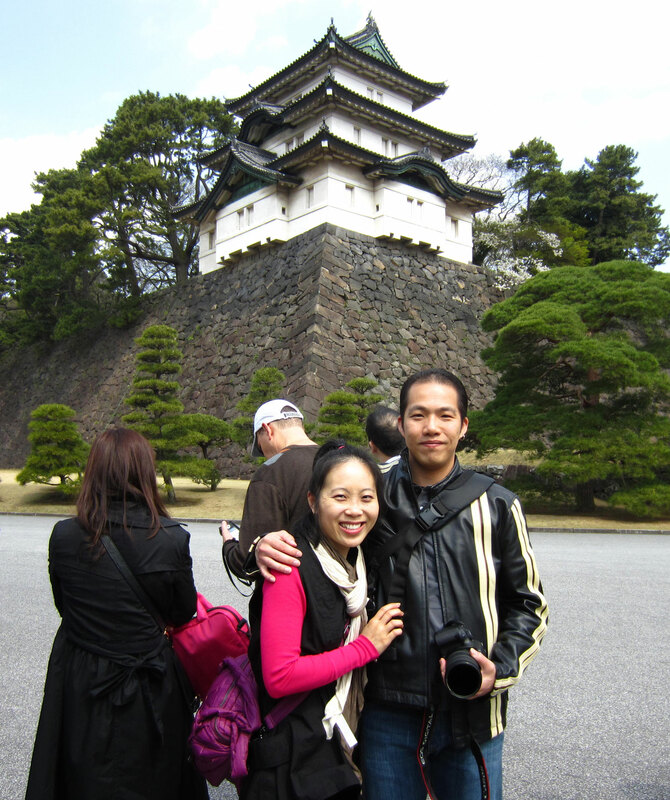 The Palace is located on the site of the former residential palace of the Tokugawa Shoguns. 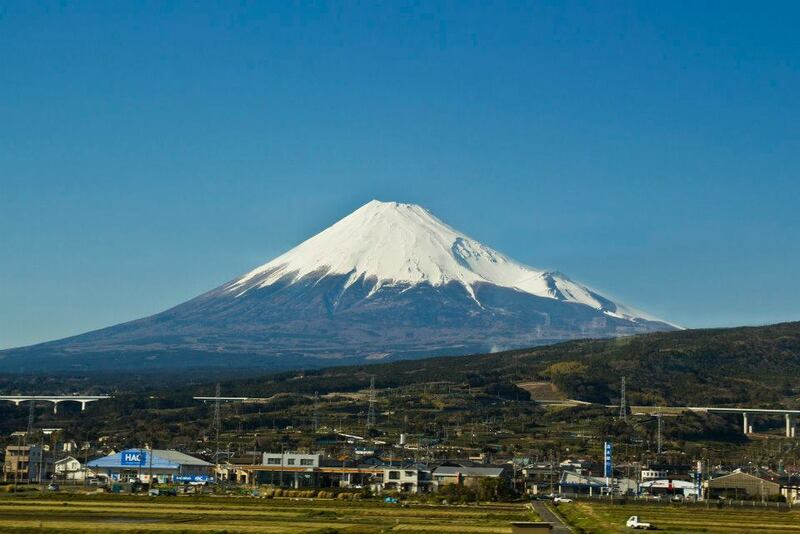 After the Meiji Restoration in 1868, Emperor Meiji moved the Imperial capital from Kyoto to the current location. 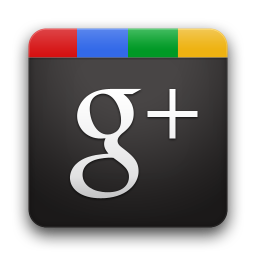 The Palace ground spans approximately 1,150,000 square meters and is surround by moat and rampart with eight gates. 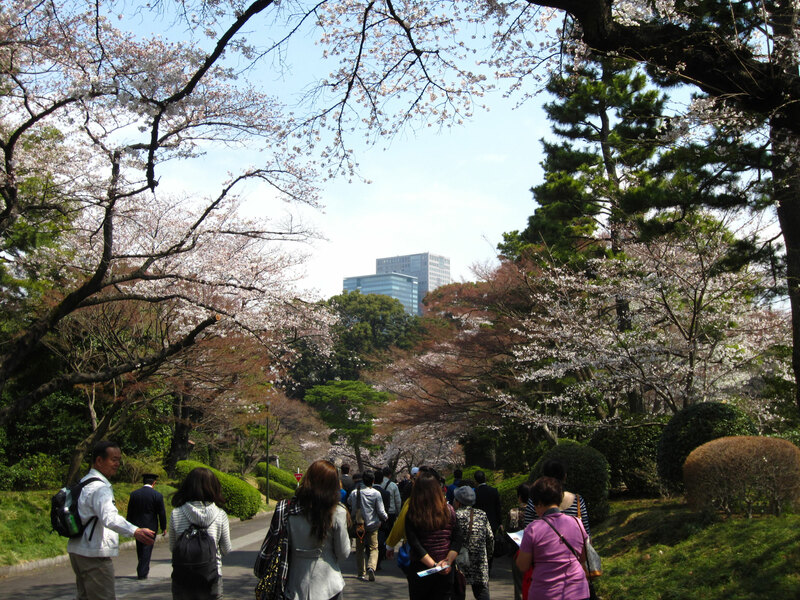 The tour covered a few buildings, namely Fujimi-yagura, the Imperial Household Agency building, Fujimi-tamon Defense house and Hasuikebori, Kyuden Totei Plaza, Seimon-tetsubashi Bridge (Nijubashi) and Fushimi-yagura Keep. 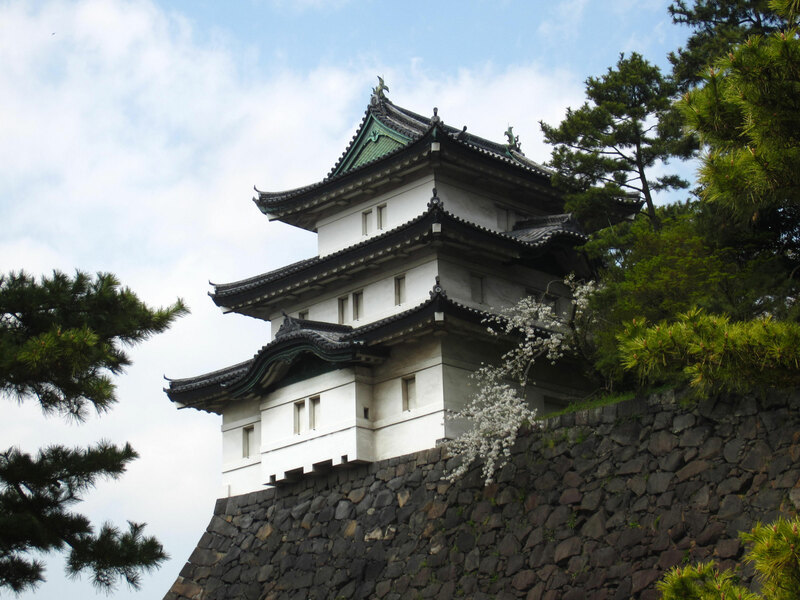 Fujimi-yagura was once a watch tower and the oldest surviving building of the Edo Castle. The tour lasted almost 2 hours and during this 2.2km walk, I felt like those old people in the tour: in need of a mo-ped and a shady area to rest. The Imperial Palace in Chiyoda-ku. 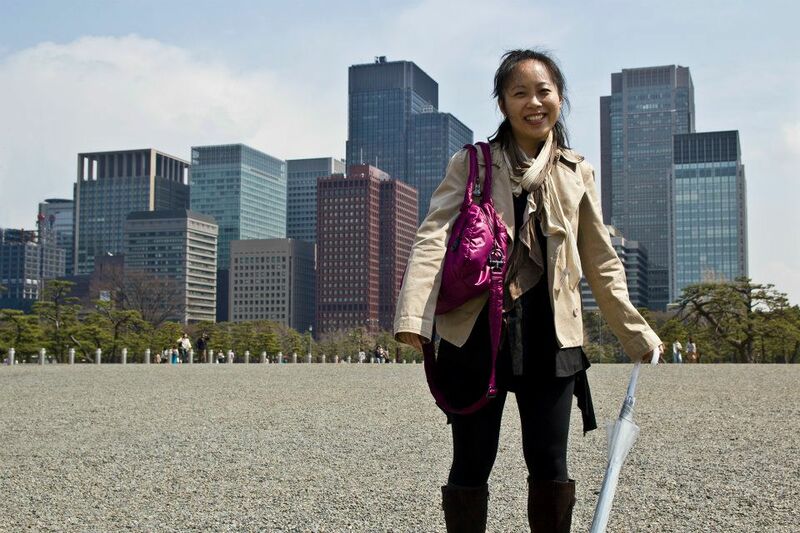 For once I’m tall…as tall as the buildings! After the tour (conducted fully in Japanese), we ambled around the pebbled grounds (while I picked some for souvenir). We really had nothing better to do. We finished what we had to do/see the day before as we thought it was going to be another wash-out day with the weather. So, we returned to Ueno at atré mall for lunch. 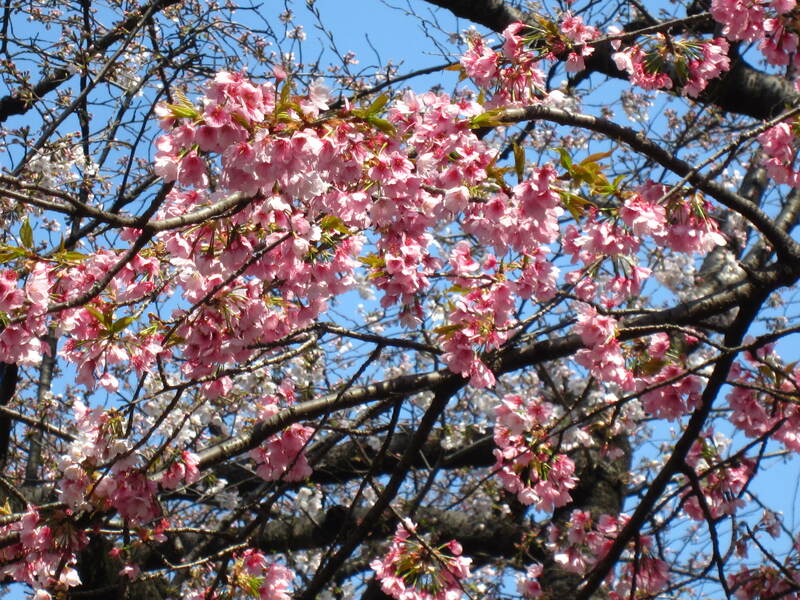 Lunch was an array of fried cakes and a bento box, which we took to the park (Ueno Koen) to enjoy and take in the sakuras once last time. We shared one bento box to leave room for dessert at a shop we spotted while scavenging for lunch. Little did we know, we were entering a famous dessert place in Ueno: Mahashi まはしserving Anmitsuあんみつ, a traditional Japanese dessert. 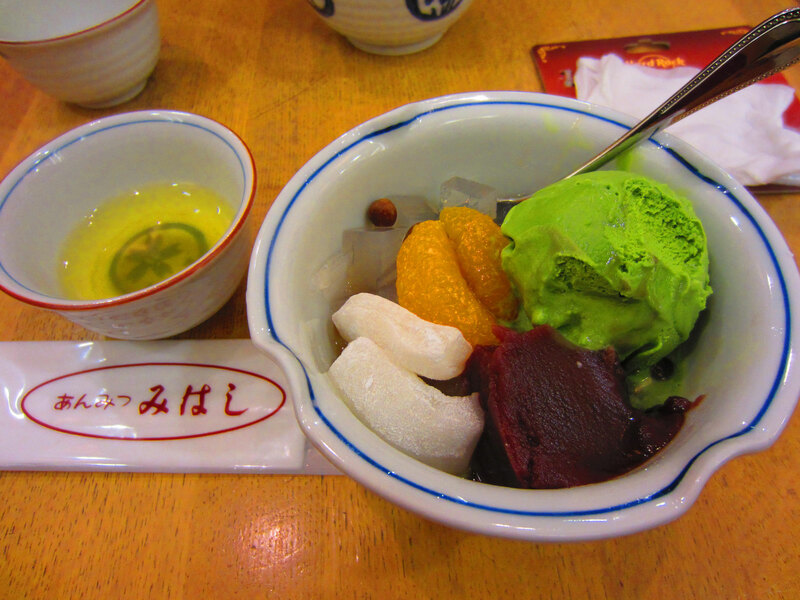 Anmitsu is usually served with sweet bean paste (anko), jelly (agar), boiled beans, a variety of fruits and ice cream. I had macha anmitsu 抹茶あんみつ (anmitsu with green tea ice cream) for 580¥, while hubs had Shiratama Kurian 白玉クリあん(rice flour dumplings) for 650¥. We got in just in time as the little place started getting packed. The locals really didn’t mind the wait (caused by the waitresses milking cows and growing the beans and fruits). Before leaving the mall, which is connected to Ueno Station, we took note that there was a bakery (yes more food- we can’t help ourselves! ), Andersen, there and we could pack breakfast for our early trip to the airport. We will get that later on our way back to the hotel. 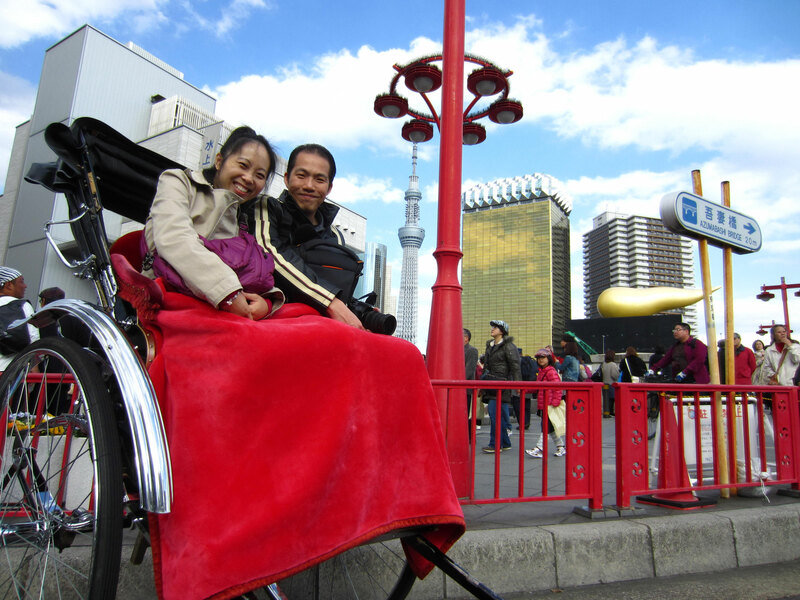 Hubs, bent on getting his rickshaw ride in Asakusa, finally convinced me to return for the ride. 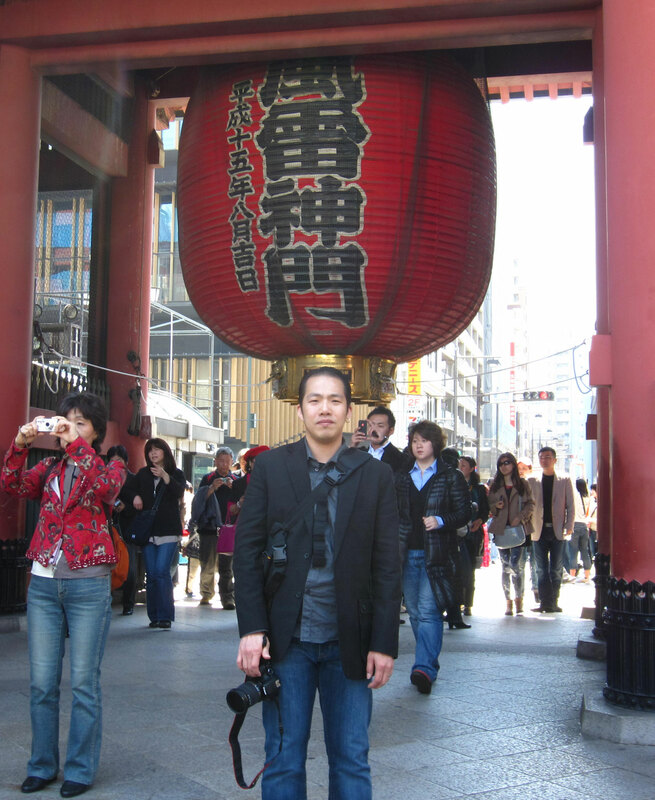 It was just as well, we met a really nice guy and he told us much about Asakusa (hence the shoe and bell story). It was an experience, but for a pretty penny (30,000¥ for 10 minutes). If this was the last thing we were going to do in Japan as a tourist, so be it! Of course, he had to stop as at the newly erected Sky Tree, soon to take over Tokyo Tower (but was only opened to the public in May 2012) as a communication tower and tourist attraction. The day and our visit came to an end, as we decided we were going to return to the hotel to unwind for the rest of the evening and finish packing. The evening passed quite uneventful afterwards; dinner in the room, watching local programming and catching some hilarious stunts and cute dogs, followed by the stuffing of our bags. What an exhilarating time we had! The people, the places, the culture and the food were all new and all good. This is one place that we will remember and return again, if given the opportunity!